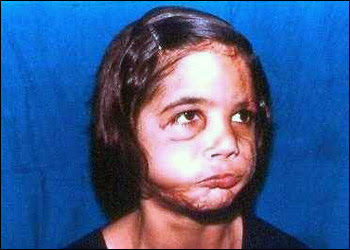 The world's first full-face replant operation was on nine year-old Sandeep Kaur, whose face was ripped off when her hair was caught in a thresher. Sandeep's mother witnessed the accident. Sandeep arrived at the hospital unconscious with her face in two pieces in a plastic bag. An article in the The Guardian recounts: "In 1994, a nine-year-old child in northern India lost her face and scalp in a threshing machine accident. Her parents raced to the hospital with her face in a plastic bag and a surgeon managed to reconnect the arteries and replant the skin." The operation was successful, although the child was left with some muscle damage as well as scarring around the perimeter where the facial skin was sutured back on. Sandeep's doctor was Abraham Thomas, one of India's top microsurgeons. In 2004, Sandeep was training to be a nurse. 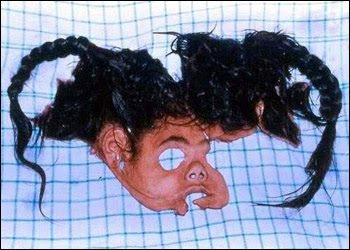 Sandeep Kaur's face arrived in two pieces at a hospital in India where it was replanted onto her skull 10 years ago. "Looking at it, I said: 'Is it possible to do anything at all?'" said Sandeep's doctor, Abraham Thomas, one of India's top microsurgeons, who was on duty when Sandeep arrived at the hospital unconscious with her face in a plastic bag. "It was actually quite a frightening sight," said Dr. Thomas. "The first response was 'Oh my, God, I cannot do that (reattach her face).'" Sandeep Kaur after her groundbreaking face replant. Sandeep's doctors were making history. Sandeep's operation is considered the world's first full-face replant. Sandeep is training to be a nurse. Says Sandeep: "I think God had to have sent Dr. Thomas. 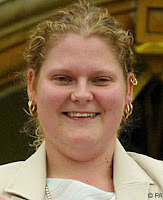 On July 25, 1978, Louise Joy Brown, the world's first successful "test-tube" baby was born in Great Britain. Though the technology that made her conception possible was heralded as a triumph in medicine and science, it also caused many to consider the possibilities of future ill-use. Brown was born to Lesley and John Brown, who had been trying to conceive for nine years, but without success because of Lesley's blocked fallopian tubes. On November 10, 1977, Lesley Brown underwent the procedure by Patrick Steptoe and Robert Edwards. She was born at 11:47 p.m. at Oldham General Hospital, Oldham, through a planned caesarean section delivered by registrar John Webster. She weighed 5 pounds, 12 ounces (2.608 kg) at birth. Her younger sister, Natalie Brown, was also conceived through IVF, four years later, and became the world's fortieth IVF baby, and the first one to give birth herself—naturally—in 1999. 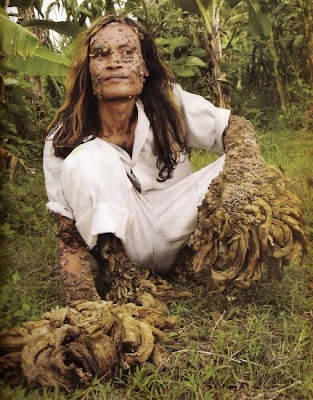 32 year old Dede Kosawa, also known as 'Tree Man', is one of the world's most extraordinary people. He lives in a remote village in Indonesia with his two children, trying to care for them. Dede, a former fisherman, has an incredible skin condition: he has root like structures growing out of his body - branches that can grow up to 5cm a year and which protrude from his hands and feet, and welts covering his whole body. He is known locally as ‘Tree Man’ and his condition has baffled local doctors for 20 years. In an attempt to earn a living to support his family, he is part of a circus troupe, displaying his 'Tree Man' limbs along with others afflicted with skin deformities in ‘freak’ shows.